If you were to make a short list of jazz standards an ‘ukulele player should know, All of Me definitely makes the cut. Here’s an ‘ukulele tab and lead sheet for All of Me. As far as jazz songs go, All of Me is pretty simple. The chords don’t wander too far out of key and when they do it’s to common back-cycle circle of fifths chords like E7 and A7. One of my favorite features of the song is the clever melody. It weaves around the chords so well that you can basically play the melody and hear the changes. There are also some very effective uses of simple chromatic playing such as “take my lips” and “take my arms” in measures nine and 13. 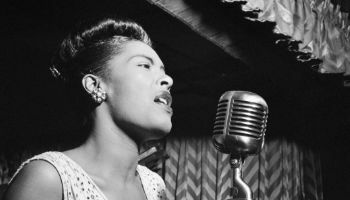 Billie Holiday is very well known for this song, but her version is very loose. That makes it hard to follow if you’re a beginner. A better reference might be Frank Sinatra’s take on it. My ‘ukulele tab for All of Me is pretty cut and dried. With these jazz standard type songs it’s sort of silly to follow one version exclusively in a transcription. Instead I like to keep the options open so there’s room to add your own flare. One of the best ways to dress up a jazzy song like this is with chord substitutions. Try playing 9th chords in the place of any 7th chords you run across, minor 7th in place of minor, and 6th chords instead of plain major chords. This tab for All of Me is in C. It keeps the chord fairly simple and makes the melody easy to play. Transpose according to your voice or which part of the fretboard you want to lean on. The intro at the beginning is a simple 1 6dim 4 5 progression. This can be removed or replaced with any other vamp that sounds suitable to your ear. Click the link for more options.